Part 1: What’s the First Step? Where do you go for answers after getting diagnosed with a life-threatening illness? Part 2: What’s Palliative Care? Understand the different types of intermediate care that allow patients to remain in their home. Learn what’s real and what’s only rumor regarding hospice care. 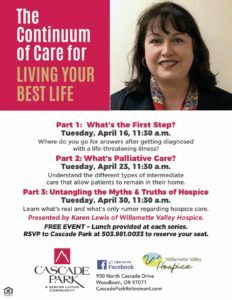 Presented by Karen Lewis of Willamette Valley Hospice. FREE EVENT – Lunch provided at each series. RSVP to Cascade Park at 503.981.0033 to reserve your seat. ← Grilled Cheese? Yes, Please!